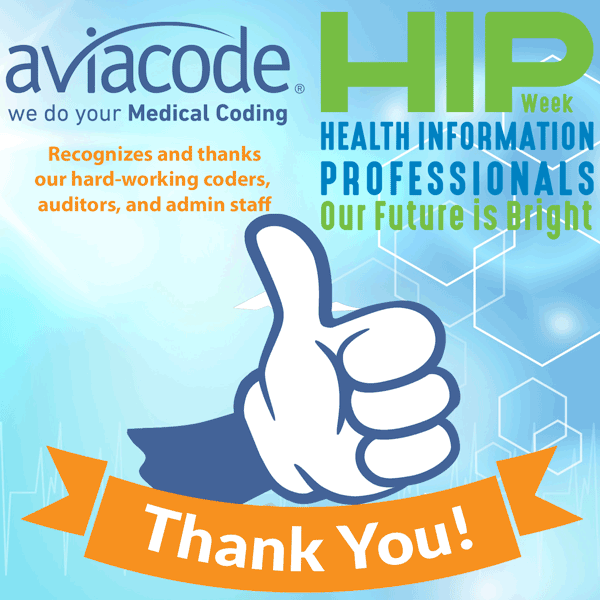 Aviacode joins American Health Information Association (AHIMA) in celebrating health information professionals during the 29th annual Health Information Professionals (HIP) this week (March 18–24, 2018). While recently conducting an onsite audit of professional services (office visits and behavioral health claims), I was asked: “What is the most valuable resource to a healthcare practice.” My answer was, as it always is, “The Physician, of course.” The conversation sat with me for several days. Why is it that the physician, who is the number one producer of revenue, is also the first person to be required to jump through documentation hoops and reimbursement nuances that can be as clear as mud? Why are more medical coders not grabbing their ear? We all know, physicians like a resource that can simplify, demystify, and ease administrative burdens. There are new positions starting to really takeoff around the idea, such as the exploding use of scribes. Scribes, however, don’t usually understand medical coding. It’s the knowledge and action taken at the medical coder level that resonates in cash flow and compliance. Medical Coders are Health Information Managers (HIM). They are so often the bearers of “bad” news that some are shy to speak up for fear of upsetting the physician. Bridging that gap is necessary. Medical Coders need to know how to communicate effectively. So how can you be HIM…and heard? There are many “best practices” Medical coders can take to communicate effectively. Typically, a physician will be more likely to listen and respond when you are able to communicate by both your actions and words of understanding of their needs, wants, and mindset. Our doctors are life-long learners, highly intelligent, and possess a deep appreciation for logic and reason. Physicians are naturally intuitive, some even feeling spiritually drawn to practice the art of medicine and healing. Generally hungry for and appreciative of tips and techniques in learning new skills, physicians crave correctness. Accurately documenting for coding and billing purposes can prove a frustrating dichotomy; it is both a challenge to achieve correctness, while also an intrusion that takes away from patient time. The right medical coder will communicate in a way that stimulates these traits and emotions.